“This is what you should tell people!” she said slamming her hand down on the table. “All the things you’ve learned. 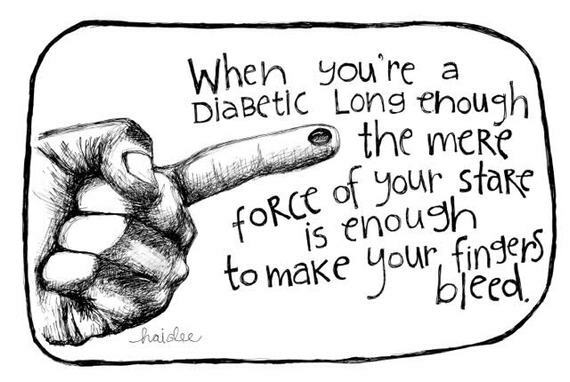 All the tricks we don’t know.” This from my friend who has educated thousands of people with diabetes and has a zillion titles and letters after her name. So here are 11 things I’ve learned about managing blood sugar from my everyday experience. Any may help you and you’re not likely to hear them from your doctor. Cartoon by Haidee Soule Merritt. 1. Don’t take your insulin until you actually taste the food. Okay, you already know that now. But here’s what to do. Take half the dose you think you should 15 minutes before the food arrives provided you’re not low. Take any remaining insulin after you taste your meal and know how much of it you’re going to eat. 2. Get pen cartridges instead of vials. My 90 day insulin supply through my direct mail pharmacy is three vials. For my mealtime insulin I use vial and syringe. If I order insulin cartridges (for an insulin pen) instead of vials, I get 15 cartridges. You do the math. You don’t need to put the pen cartridge in a pen, use it like a vial. Extract the insulin with your syringe. However, don’t push air into the cartridge as you do with a syringe. And do look for air bubbles in the syringe when you withdraw the insulin. If you get them, just flick them out. Don’t extract insulin from an insulin pen with a syringe, just the cartridge itself. 3. Everyone, stop saying “control!” I wish people would stop using that word. Yes, you can absolutely do things to influence your blood sugar, but you cannot control it. There are too many variables at play: stress, illness, exercise and its lag time, alcohol, carb guessing with food labels and meters up to 20% inaccurate. Managing blood sugar is not as simple and straightforward as your doctor seems to think. Plus you can only do as well as our present day tools permit. My management would be far better with faster mealtime insulin. And, take yourself off the perfection pedestal otherwise you’ll get knocked off every day. Just do your best, appreciate your effort and keep breathing. 4. Take a small amount of insulin to blunt your morning rise. Due to the Dawn Phenomenon, my blood sugar rises like a runaway train in the early morning hours. I take 1 unit of rapid-acting insulin as soon as I wake up, usually around 6:30 or 7 A.M. It halts the rise. I take the rest of my dose with breakfast usually an hour later. 5. You CANNOT have blood sugars close to normal without having lows. It’s your choice – you can let your blood sugars run high or if you want to be nearer the lower side of your target range often, know you WILL have lows. Be prepared. I carry glucose tablets in all my purses, pouches, pockets and knapsacks and keep a stash in the kitchen and by my bed. SweeTarts and Smarties work fine too and are nicely portable. 6. Reuse syringes and pen needles unless they break, bend or lodge in your body. No, don’t reuse bent or broken needles, ever. And, yes I’m kinda joking, but while needles dull with reuse, you can safely reuse them a few times. Use them for a few days or a week depending on how many shots a day you take. Stop reusing when you notice you feel the shot more than you should. 7. Stop eating a lot of carbs. The sugary foods (cakes, cookies, muffins…) and starchy foods (bread, bagels, pasta, potatoes, simple grains like coos coos…) you love, spike your blood sugar – and then drop it, wham. You end up in a cycle of high and low blood sugars and ravenous. Plus, high blood sugars call for extra insulin and insulin stores fat. Eat some carbs, mostly from vegetables and small amounts of fruit, beans and whole grains, and your blood sugar will become more steady. 8. Don’t react too quickly. For decades I dreamed of “Pinkie” my continuous glucose monitor – a tool that would tell me if my blood sugar was going up or down and how fast. But when Pinkie gives me the “up” arrow, all I want to do is stop her. So I take more insulin only to then drop too low. Watch and wait – that 45 or 90 degree arrow often flattens out a minute or two after you see it so nothing needs to be done. 9. Routine is a powerful tool. Doing most things similarly each day – eating relatively at the same time, and the same foods or types of food, doing my exercise at the same time of day – keeps my blood sugar more predictable. When I’m off my routine, usually due to travel, that predictability and my “nice” blood sugar numbers, all but disappear. 10. The “X” factor. Even though I just told you routine makes blood sugars more predictable, there is the “X” factor. You can do the same thing, the same way, the same time, two days in a row and get different results. But it will happen less if you do things routinely. 11. Diabetes IS a second job. With no admin person, travel dept, expense account or colleagues to have a drink or cronut with after a hard day’s work. No matter how long you’ve had this job, you’ll still feel like an idiot some days because many of your guesses will be wrong. Give yourself an occasional vacation – skip a blood sugar check here or there – and definitely reward yourself with a hefty end of year bonus. Have you learned something that would help someone else they probably wouldn’t hear from their doctor? Great advice Rita. I’ll add my most important lesson from forty years of battle. the foundation of good control.